The voluntary agencies should not discriminate in any manner on the basis of religion, caste and creed, and should not use the programme for propagation of any religious practice. The voluntary agency should be a body that is registered under the Societies Registration Act or the Public Trust Act, and should have been in existence for a minimum period of two years. Commitment to undertake supply responsibility on a no-profit basis. Willingness to work with PRIs/ Municipal bodies in accordance with relevant guidelines of the State Government. Financial and logistic capacity to supply the mid day meal on the requisite scale. It will furnish to the body assigning the work to it an Annual Report along with audited statement of accounts in terms of all grants received from the State Government, both in cash and kind, duly certified by an approved Chartered Accountant. In order to implement the programme effectively, therefore, an NGO must be well equipped to handle the logistics of the programme. 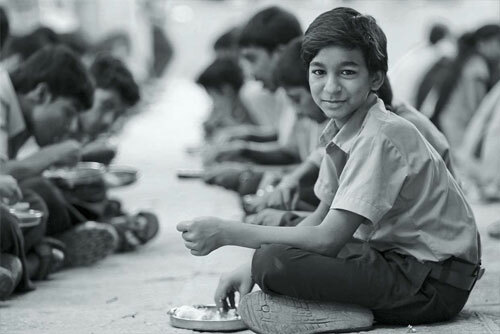 A non-profit must have ‘financial and logistic capacity to supply the mid-day meal on the requisite scale'. This solution has allowed organisations such as Akshaya Patra, who have kitchens across the country, costing an average Rs. 80 million (8 crores), to set up their massive infrastructures and conduct the Scheme in line with Government’s guidelines. It gives NGOs a means to raise funds for the deficit incurred during programme implementation. The Government has even made provisions for donations raised. For example in 2003, a committee, headed by the former Chief Justice of India (the National Committee for Promotion of Social and Economic Welfare, Department of Revenue, Ministry of Finance, Government of India) recommended Akshaya Patra as an eligible project that could raise donations up to Rs. 220 million (22 crores) with tax benefits to the donors for 3 years. In 2006 the committee reviewed Akshaya Patra’s programme once again and raised the amount for tax free donations to Rs. 1000 million (100 crores). Another review in 2009 increased that number to Rs. 2000 million (200 crores) for a period of 3 years. NGOs promote community participation through active volunteering and fundraising. They involve all layers of society and help the Government make the mid-day meal scheme a ‘peoples’ programme’. One of the conditions for eligibility is that ‘persons managing the affairs of the association or institution are persons of proven integrity’ (National Committee for Promotion of Social and Economic Welfare, Government of India). Another is that ‘the association or institution maintains regular accounts of its receipts and expenditure’. Reports must be submitted regularly by the voluntary organisation. The involvement of a number of private bodies in the implementation of the Mid-Day Meal Scheme has resulted in visibly better performance.